The Dollhouse—in this novel and IRL (in real life)—was a nickname for the famous Barbizon Hotel for Women, a New York City institution that provided a safe haven for single women from 1927 until 1981. It was a rite of passage for certain young ladies new to New York, and the list of former residents who later became famous is a who’s who of 20th century American life: Joan Crawford, Grace Kelly, Liza Minnelli, Cybill Shepherd, Candice Bergen, Joan Didion, and Betsey Johnson. 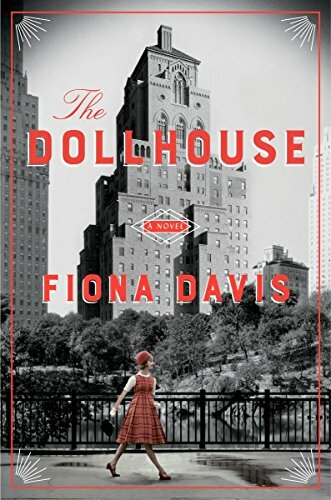 Clearly, the real life Barbizon or “dollhouse” had a rich vein of history that Fiona Davis mines to full advantage in this clever debut novel. Davis, a former journalist, tells the story of two fictional women staying at the Barbizon. The chapters alternate between the story of Darby McLaughlin, a plain Jane who moved to the hotel to attend secretarial school in 1952, and Rose Lewin, a journalist who inhabits a luxury condo in the present day with her boyfriend Griff. The two stories overlap when Rose, in a chance elevator meeting, becomes obsessed with Darby, who by 2016 is a senior citizen still living in the hotel on the floor reserved for the rent stabilized tenants. When Rose expresses curiosity about Darby, a doorman with loose lips is only too happy to fill in the details. The doorman says Darby always keeps her face covered (she’s kind of a Sia-type character) because of scars she suffered in a contretemps with another woman who fell or was pushed off a hotel balcony in 1952. The hotel management at the time kept it everything hush-hush, the doorman says. Dangling a story like this in front of an increasingly desperate journalist like Rose drives her a bit crazy and she becomes obsessed. Rose sets her mind on telling that story no matter how many roadblocks. There are quite a few as it turns out but nothing—certainly not journalistic morals—can stop Rose. Davis tells the story in functional prose that gets the job done, but that’s not a problem because Davis’ plot is the thing. It’s clever and full of twists and it’s very hard to put this novel down. It’s a simple idea but very well done, a story well told.